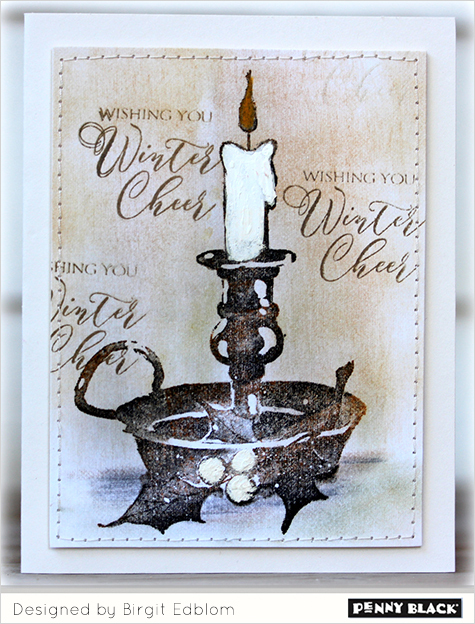 This card was made for a challenge on SCS "All Natural"
I used stamps and dies from Penny Black! There´s a recipe on Less is More´s blog this week! Peeled it to my watercolored background and placed the beautiful trees from Penny Black to it! Here´s my card for the sketch on CAS Colours & Sketches blog this week! I think their challenges are so inspiring!! Here´s my card for the challenge on Addicted to CAS´s blog this week! I love birches!! 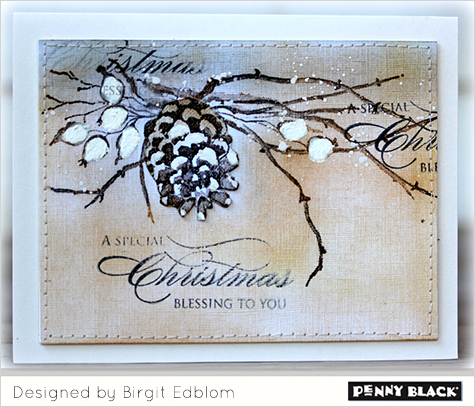 Today I made a card with the new birch stamps from Penny Black! The theme on Less is More´s blog this week is EXOTIC! Here´s my card for the CAS(E) this Sketch #186! Here´s my card for the color challenge on CAS Colours & Sketches blog this week! Today I made a card with a leaves from Penny Black! Love them! Here´s a card with the sweet flower stamp from Technique Tuesday! Here´s my card for the sketch on CAS Colours & Sketches blog this week! I cut a piece of paper and fold it! The stem is from CAS-ual Fridays. My card done for two challenges today! I think wild nature is the most relaxing view and so is watercoloring! have a chance to win a $25 shopping spree to their online store! Here´s a card inspired by Lavender Flowers! I visited an island, Hvar, in Croatia where you can see big Lavender fields! Beautiful! I used the flower dies from CAS-ual Fridays and a sentiment from Technique Tuesday! There´s a color challenge on Less is More´s blog this week! My card for the challenge on CAS(E) this Sketch´s blog! Is it time to start thinking about those Christmas cards? There´s a sketch at CAS Colours & Sketches blog this week!